We are not the only ones questioning the textbook playbook for environmental protection. 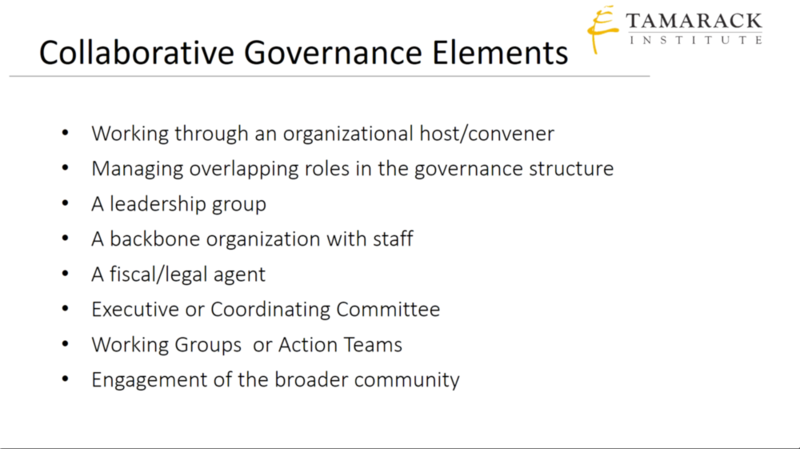 Last week, we attended a Collaborative Governance webinar hosted by the Ontario Trillium Foundation and the Tamarack Institute and maybe now is the time to inform and inspire our own strategies for greater collaboration in Great Lakes governance. We are especially thankful to the Trillium Foundation for their funding of the Water Friendship project (managed by the Great Lakes Commons Map). So what is Collaborative Governance, why would it be needed, how could it work, and what are some opportunities for Great Lakes partners to explore? Great Lakes Commons has been collaborating with other groups on water injustices in Michigan and Ontario. Could we be planting the seeds for an emerging forum on grassroots Great Lakes governance? If so, we have lots to learn and get started on. The webinar started with a survey. "What is the biggest challenge for working more collaboratively on a complex problem?" Our answer (and the most popular one among all the participants) was the limited internal capacity, facilitation skills and scarce resources. Thanks to this webinar, this post can identify some key factors for improving our collaborative capacity and skills and hopefully later -- resources. Here's the survey choices. What would be your answer? Great Lakes Commons has been working for years on platforms, resources, and projects that engage more people in water governance. One of the common goals we've designed and promoted is the Great Lakes Commons Charter -- with it's associated First Principles. GLC has tried to foster the spirit of collaboration outside of the Charter too by promoting every new petition or campaign protecting the Great Lakes. The central goal for us however is to work across issues, borders, and ancestry. A common framing of Great Lakes issues includes a host of water threats. Pollution, privatization, pipelines, plastics..... these are always on the list at conferences, in books, and media reports. What's often missing is the issue of governance -- who gets to decide what the rules are and how they are implemented and enforced. GLC is focused on governance because this is where we see the greatest opportunity for transformation. Let's use these 3 key terms to ground our understanding. Working collaboratively goes beyond good intentions. The webinar named 6 Principles. Do you have experience with one or more of these? Share some examples in the comments section since learning from each other's efforts will build the capacity we need. It's easy to see that the current players, institutions, and beliefs running Great Lakes governance are not interested in a collaborative approach. Using the analogy of the 2008 market crash, we published this article. Yet we remain committed to shifting the paradigm even if it takes 7 generations. Which of these Principles match your personal or organizational gifts? 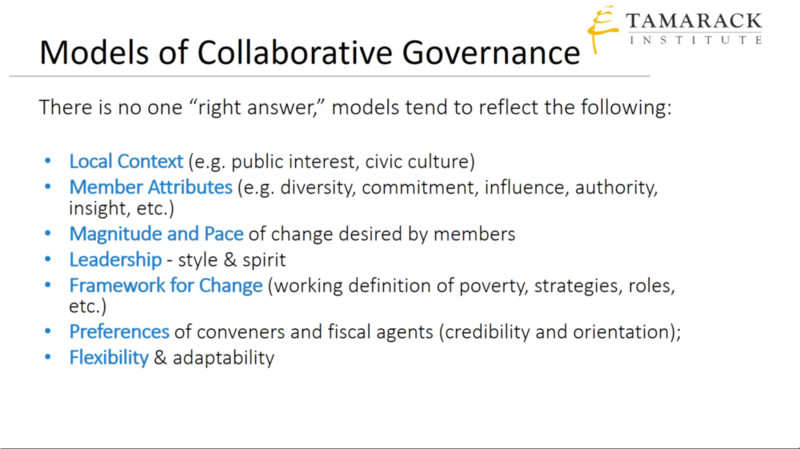 What are the key Elements that work together for your collaborative governance project? These 8 give your common goal a fighting chance of success. How often do we think big and dream bigger on HUGE problems and then only have 3 or 4 of these Elements in our work? Great Lakes Commons has been working with a new coalition of water groups since last summer on the intersections of bottled water, tap water, private profit, public trust, and colonial claim. This coalition organized a summit in Flint Michigan this past fall and continues to collaborate on water justice futures within the borders of Michigan and Ontario. This list could serve as a checklist for our 2018 planning. Have you had success working with several of these Elements as part of a collaborative governance project? Share your examples in the comments section please. Even once you've got all these Elements, then there's working through the following set of decisions. The water justice coalition mentioned above is using a needs and capacities survey for each member group. We also have monthly meetings with shared responsibilities of hosting and documentation. If we stick together and ideally get some financial support, this list below serves as an important guide for the coalition's organizational and strategic success. Do you have any examples of how your collaborative effort considered items in this list? Any do's or don't do's? Is there anything missing when working on a water governance project as complex and urgent as the Great Lakes? Just when you thought you had a handle on this Collaborative Governance planning, here's more to consider. Every issue, organization, and context is different, but what emphasis will ultimately shape your unique collaboration? Will this be intentional or only realized after a few failed attempts? When a coalition of groups want to be collaborative, they also need to figure out what model works for them. A water justice Toolkit for the Great Lakes could act as a bucket for engagement and action, but how do we create consistency in our internal and external processes? How do we ensure that groups with the most financial resources don't diminish the power and perspective of structurally marginalized groups with less access to mainstream legal, financial, and communications support? These groups are often best organized to heal the most drastic impacts of failed water governance. Our model should also be responsive to the different types and struggles of water injustices. It would take 1 -2 years for a coalition as diverse and busy as our water justice one, but ideally a model would be designed and affirmed by the coalition for maximum social impact and coalition unity. For instance, many hours are still needed for finding a common agreement on the Framework for Change. What does this mean for access, affordability, and authority for drinking water in the Great Lakes? With different and competing local, state, provincial, federal, and Indigenous governance bodies -- how will our vision best be realized? All this collaborative work for what? With so many challenges to transform Great Lakes governance, what indicators does the coalition have to measure its own success? Using the water justice coalition as an example, we have created space for shared learning about the complex issues we face and we've been pacing ourselves for upcoming political opportunities and timely outreach efforts. One way or another we will have to address how we are collectively achieving some personal and organizational objectives. What success have you had working on a collaborative governance project? Any additional markers that make a difference? We'll get to the Steering Committee next, but how do we enable the best leadership for this coalition and/or how do we address gaps in our capacity? Combinations of these 7 Competencies in any person or committee would strengthen the team and lead to short and long term success. It's also an interesting list to use when assessing how to best serve with one's time and experience. What gifts do we each bring to the collaborative work and how can we best compliment each other's skills? Which Core Competencies does your team have the most of or least of? Below is a diagram for Collective Action. On the left we can see the specialization of the Steering Committee (project guidance) and the Backbone team (project delivery). We can also see the focus of various working groups and their support with both a Chair (who can be apart of the Steering Committee) and an ecosystem of partners that are closest to the issues at hand. All of this work is tied together with a Common Agenda and Shared Metrics for success. Have you been part of a collective like this? What roles did you play? How well could this model work for you? Money is never a replacement for all the passion and talent coalitions bring to complex issues, but it can ensure commitment and consistency. Money can reward the Backbone team and energize the many circles of unpaid supporters throughout our communities. 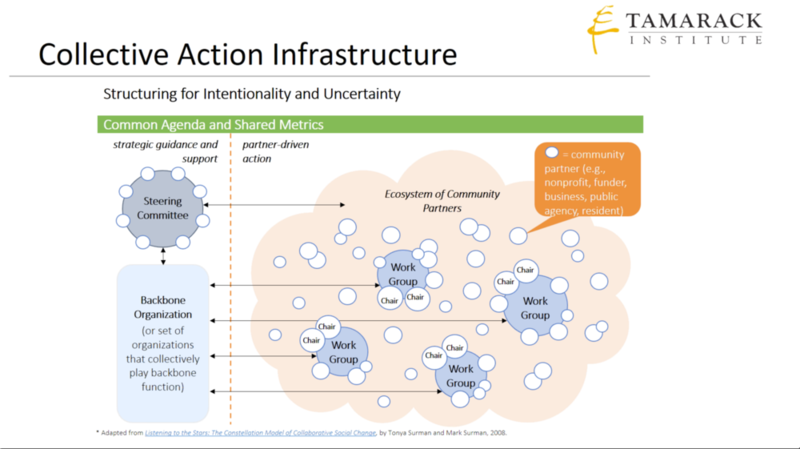 If we carefully map out our plans using Collaborative Governance best practices, funders will want to jump on board. So there it is. Big challenges require collective organizing and decision making. We can't use the same rules and rule-making processes that created the problems in the first place. With the right combination of principles, elements, models, metrics, competencies, and structure -- the spirit of commoning comes alive in the Great Lakes. Are you involved in a collaborative governance project? Tell us how you've experienced these best practices. Do you want to join the Michigan/Ontario water justice coalition? Leave us some comments and get in touch. Older PostIndigenous Led Water Protection: two examples to bring to the Great Lakes?